Participants will leave having created a community of other helping professionals, become more embodied (integrating mind, body and spirit), increased ease in their personal and professional lives, and fostered freedom of expression. 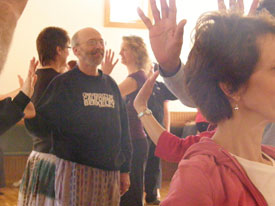 Interplay and Self-Care for Caregivers provides skills and tools for practitioner self-care that are based on the Eight Body Wisdom Principles of InterPlay: Easy Focus, Body Data/Knowledge/Wisdom, Internal Authority, Physicality of Grace, Exformation, Body Wisdom Practices, Incrementality, and Affirmation. This is accomplished in a context especially geared to those facing the challenges and stresses of helping others. Participants will leave having created a community of other helping professionals, become more embodied (integrating mind, body and spirit), increased ease in their personal and professional lives, and fostered freedom of expression. Learn InterPlay-based techniques to lead their lives in more embodied, playful ways for the purposes of self-care. Reclaim voice, movement, stillness, and stories as primary ways of knowing and discerning. Ground themselves in a communal ethic of play to replace stress with health, creativity, joy and purpose. Develop improvisational skills to increase ease associated with some client/patient interactions and with speaking in front of groups. Learn and apply the eight InterPlay tools of Easy Focus, Body Data/Knowledge/Wisdom, Internal Authority, Physicality of Grace, Exformation, Body Wisdom Practices, Incrementality, and Affirmation in their own lives to support their self-care. Address ways InterPlay techniques and principles can support cross-cultural communication and as a way to support and empower marginalized populations. Bastyrs Cancellation & Refund Policy. Sharie Bowman, MA is a Licensed Mental Health Counselor and Regional InterPlay Leader. She has been a certified InterPlay leader since 2004. She leads the year-long foundational InterPlay training course called the Life Practice Program on a regular basis. She is particularly intrigued with the potential InterPlay has to support people to live healthier lives by embracing the wisdom of their bodies and how InterPlay can support those who are care-givers and helping professionals find renewal. In her private practice she regularly weaves InterPlay’s life-enhancing forms and philosophies to help individuals and families thrive. For over 20 years, she has been exploring the wisdom of the body through a variety of modalities including InterPlay, Authentic Movement, Core-Energetics, and Biodynamic Psychotherapy. Sharonne O’Shea is currently an acupuncture student at Bastyr University, previously practiced law in Washington, and is an InterPlay leader who has brought InterPlay practices to intergenerational participants, classrooms, dance studios, churches, and gyms over the last seven years. She is interested in building a network of joy and ease for helpers as these individuals are often relatively isolated on a day-to-day basis.